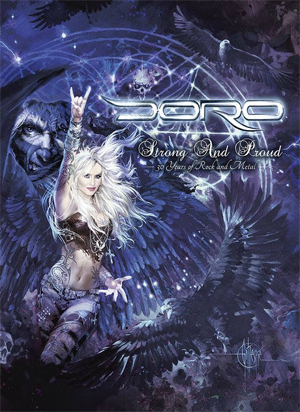 The metal Queen, DORO, will release her brand-new 2Blu-ray/3DVD+CD package entitled Strong And Proud - 30 Years Of Rock And Metal, on June 24th, 2016 through Nuclear Blast. The third live clip from this package has been launched - "Love Me In Black" (Classic Night). Check it out now on KNAC.COM right HERE. Pre-order your copy of Strong And Proud - 30 Years Of Rock And Metal HERE. Order DORO's current single "Love's Gone To Hell" HERE. 30 years of DORO! 30 years of rock and metal! 30 years of dedication, passion and love for the music and her fans all over the world. DORO celebrated her 30th anniversary of performing live during 2013/2014 by touring the world extensively for a year and by playing three official anniversary shows! The tour kicked off impressively in front of 85,000 people at the world's biggest metal festival, Wacken - followed by two sold-out nights in her home town, Dusseldorf, where she also started her outstanding career. And everyone came to party with DORO: Phil Campbell (MOTÖRHEAD), Biff Byford (SAXON), Chris Caffery (SAVATAGE), Blaze Bayley (ex-IRON MAIDEN), Joakim Brodén (SABATON), Hansi Kürsch (BLIND GUARDIAN), Udo Dirkschneider, Uli Jon Roth, LORDI as well as many more amazing guests - the list of stars who celebrated the metal queen on stage comes across like a "Who's Who" of the rock and metal scene. Three decades of DORO - three unforgettable nights - forever captured on three DVDs and two Blu-rays; including an two-hour plus, great music movie, which delivers deep insights behind the scenes and inside the heart of DORO. Nuclear Blast releases this incredible DORO anniversary package on June 24th, Strong And Proud - 30 Years Of Rock And Metal. A fan-tastic memory for everyone who has seen DORO live worldwide during her anniversary and a revelation for all fans of good, hard rock music and classy live performance with blood, sweat and tears. DORO: "We spent endless hours, days and nights working on the DVD, because we wanted to present a real highlight for all rock and metal fans for the 30th anniversary. We took care of every detail. It began already with the bombastic stage in Wacken, we worked one year on its design. In Dusseldorf, we even celebrated two nights in a row. One "Classic Night" with a 40-piece orchestra and one "balls to the wall" rock show on the second evening. It continued subsequently nonstop - with an anniversary tour, with led us to Russia, South America and my second home, the USA, among others." Strong And Proud - 30 Years Of Rock And Metal contains 38 songs in total, a full load of rock and metal, including all DORO classics, many old WARLOCK hits and ingenious cover versions of songs such as "Fear Of The Dark" (IRON MAIDEN) and "Balls To The Wall" (ACCEPT). The filming and cutting is phenomenal, and the sound crystal-clear. Once again, the packaging was drawn by DORO's favorite artist, Geoffrey Gillespie. Additionally, Strong And Proud - 30 Years Of Rock And Metal offers a unique music movie with a two-hour plus documentary, Behind The Curtain, Inside The Heart Of DORO. It gives the spectator deep and detailed insights into the world of DORO. DORO: "There's always great impressions from all over the world and never before seen pictures from our life behind the stage. The camera team accompanied us for over one year everywhere and captured very emotional, intimate and human situations." The title hits the nail right on the head: Behind The Curtain, Inside The Heart Of DORO.